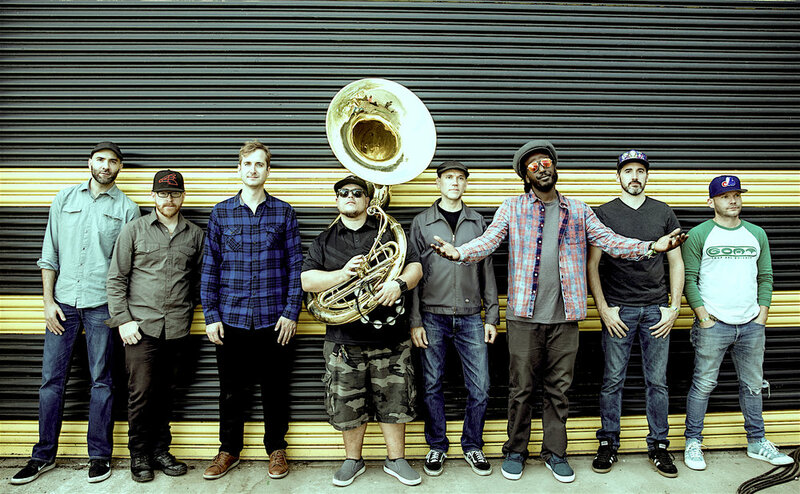 Lowdown Brass Band Release Their Roaring New Single "Ghost Town"
We’ve sure seen our share of hip-hop/funk brass bands over the years, but nothing has compared to the thoughtfully hip, energizing and funky sounds of Lowdown Brass Band (LDB). This thriving eight-piece second-line extravaganza has been marching their way through venues across the U.S., steering audiences through a thrilling brass-powered experience that emulates a diverse and irresistible sound. With a blistering array of horns, funktacious drums and a powerful sousaphone, the Chicago-based brass set has also perfected a gritty and dynamic sound through the genres of hip-hop, soul, ska and rock. The fusion of MC Billa Camp’s poetic rhymes and adaptive storytelling, one of the band’s leading vocalists, has helped catapulted LDB’s national movement with cruising vocals, ferocious depth and provocative flows that helped audiences to capture the LDB experience. With the release of their fifth self-produced studio album Lowdown Breaks arriving January 19th, Lowdown Brass Band has continued to build upon their hip-hop, ska and jazz styles under their newest single, “Ghost Town". Lead by Billa Camp with illustrious wordplay, keen lyricism and intricate arrangements, “Ghost Town,” exemplifies LDB’s music through groovy brass hip-hop with a unique alloy of genres that is indulgently entertaining to hear. What began as a Chicago collaboration between Lowdown Brass Band and Chicago hip-hop punk set, The Dread,” has grown into one of LDB’s biggest songs of 2017, aligning perfectly with the 2018 release of their new LP. With a commanding tempo ripe with roaring horns, long brass and robust beats, the song contrasts perfectly with Billa Camps flourishing vocals and profound individuality. What we really dig about LDB’s new track is the music video – an entertaining, high-energy adventure shot on a fishing boat during Lowdown Brass’s Alaskan tour in July 2017. As a recommendation of a great way to see the Cordova region in Alaska, the band brought their instruments on the boat and randomly had a quick jam session right in the middle of the Prince William Sound. Suddenly, the session quickly turned into a video shoot for “Ghost Town” with people on the boat shooting the session entirely on their iPhone’s. A wild ride filled with humor and dance, Lowdown Brass Band’s “Ghost Town” video is one for the ages and is certainly a must watch! LDB’s barrier breaking sound is as intricate and explosive through your headphones, as it is on-stage: A second-line brass-knuckle spectacular that gets you on your feet and keeps the party pumping all-night long. They’re a band that get’s it: progressive brass beats with a festive attitude and a groovy onslaught of stellar vocal harmonies and horns that are marvelously entertaining and unique. Lowdown Brass is a band that can’t be missed and a must see for when they march across your town. For more on Lowdown Brass Band, follow their social media and stream/download their music below.